Note: Restaurant closed in 2016.
this review was extensively updated 10/2012. Grüner isn’t a “German” restaurant, nor does it bill itself as such; rather it is Alpine. This is a vast region that includes pieces of France, Italy, Austria, Switzerland, Slovenia, Hungary, and even a bit of Balkan and Mediterranean influences. All of this is alongside the distinct regional cuisines of Germany. Like billing a restaurant “Italian”, most of us know the cuisine of Tuscany can be quite different than that of Modena, Venice or Rome. The same goes for Germany as well as the Alpine Region. This makes Grüner a bit more complicated than just schnitzel and wursts, although they have those too. For example, Maultaschen has its roots in the Swabian area of Germany, such as Stuttgart while Schinitzel is a traditional Austrian dish. The architects did a nice job with the space, which used to be a furniture store. The front door opens into a small bar area which has a few little tables. If you try to eat in the bar while people are waiting, you may find it overwhelming. The dining room is on two levels. Earthy colors are easy on the eyes, the lines clean and modern. Traditional pomace olive oil candles flicker on the tables. It is a very live room and when full, it is difficult to hear one another talking. The wood panels at the end of the dining room help diffuse the noise level; however the bar is a cacophony when it’s busy. Although Germany has a fairly regulated beer culture, the number of breweries is second only to the United States, resulting in a great variety. It is less prone to various “flavorings”, because of a regulation called “Reinheitsgebot”, which limits the ingredients to water, hops, barley and yeast. Grüner generally keeps the beer focused on selection from the regions of the food they serve. Six are available on draft, four by the bottle. Prices range from $7 for a 16.9 oz bottle of Stiegl Goldbrau lager to $9 for an Einbecker Ur-bock Dunkel. There is something for everybody, including a few local brews. The same can be said for some of the spirits. The menu currently features German specialties like Linie Aquavit, Schönheit Schlicte Steinhaeger Dry Gin and Schladerer Black Forest Kirschwasser. Cocktails are interesting and make the best of flavors from throughout the world. 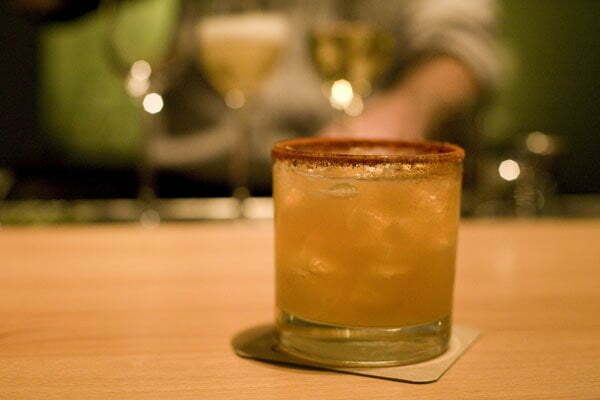 Try the Die Saure Schotte – Isle of Sky Scotch, Cynar, lime and tea syrup. It is terrific, a robust anathema to a rainy evening; balanced and smooth, all the components – bitter, spice, sweet and floral – working together. If you are more into savory drinks, the Austrian Monk is also a good choice. It is a mix of gin, yellow Chartreuse, celery and lemon. Cocktail prices begin at $9. The wine list is large and regional, so it may consist of selections you are not familiar with. However, the staff is very knowledgeable about the choices, and led me to some excellent bottles that I might not have otherwise tried. I have a love for good Grüner Veltliner, and they have some nice bottles to choose from, along with a large group of Rieslings that cover the wide range of characteristics present in the varietal. About 40 are available, at a good range of prices from $40 and up, with markup about average. Food is available in the bar; that is your only option if you are taking advantage of the happy hour. The service is somewhat uneven; some nights it is great, at times pacing can seem a bit off. 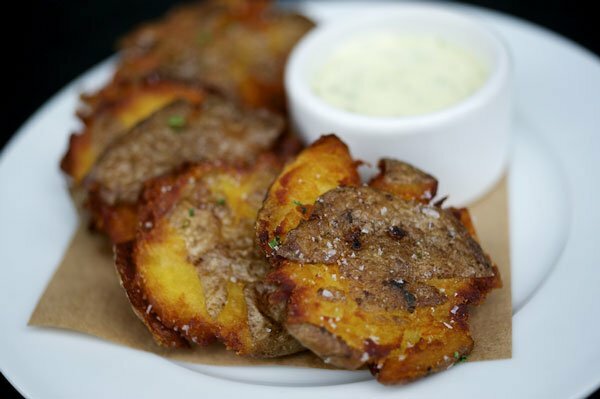 Friends raved about the fried, smashed yellow Finn potatoes in a “special sauce” which had a nice dill flavor, but seemed more like “ranch” than special. The potatoes were just fine, but the sauce was weak and runny. 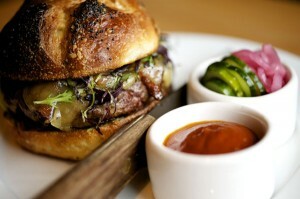 The Grüner burger is one of the best in town, but is only available in the bar. The poppy seed bun is perfect, made in-house, cooked until slightly crunchy; substantial enough to stand up to the juice from the meat patty and the currywurst ketchup. Thin house-made bacon is draped across the top, and you have a choice of thinly sliced fontina or cheddar cheese which runs down the sides like a seductress. Pickled onions and cucumbers are carefully nestled in ramekins. While you are waiting for your table, order some of the crisp polenta croquettes stuffed with raclette cheese. Crunchy and creamy, they go perfectly with a cocktail. Tarte flambé is the French name for a famous Alsatian dish named flammeküche. Grüner bills theirs as “Alsatian Pizza”. It’s not quite true to the original, as the crust is thicker and more pizza-like in Grüner’s version, but the bits of smoky lardon, crème fraîche and subtle sweet onions are textbook. It’s a nice starter to set the mood for Alpine cuisine, and substantial – split it with your companions. The tarte and a salad would be enough to serve two for a light supper. 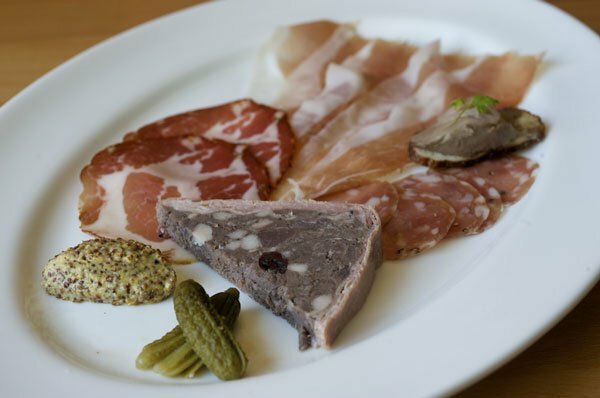 Everything on the charcuterie sampler is made in-house, except for the speck which is from Italy, and the salame gentile, which is from rotating vendors such as Olympic Provisions. Currently they are joined on the plate by spicy coppa, Chop salami, house-made rabbit mortadella, country pâté, liverwurst canapés, excellent pickles and grain mustard. With these vendors, it is hard to go wrong. Maultaschen are described as “Swabian ravioli” filled with onions, spinach, beef and pork. They are served in a broth studded with fresh green chives. The raviolis have a thin skin which lets lots of flavor come through; you can taste all the ingredients. The beef and pork are finely ground, the beef richer in flavor, a little smokiness somewhere between the pork and spinach. I like this dish much more now than when Grüner first opened. Few chefs in Portland show salads the respect they deserve. Grüner’s are in perfect harmony with the seasons and made with a deft touch. For the price, they are an excellent deal. 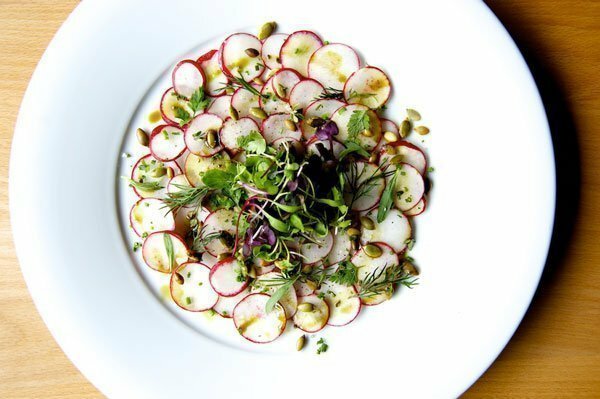 The shaved radish salad with pumpkin seed oil, pumpkin seeds, herbs and vinegar was light, harmonious and was pure early spring. Beautiful paper-thin concentric circles of pink, red and white radishes contrast against the plate while a little mound of greens brightens the center. The salad is lightly dressed with Styrian (Austrian) pumpkin seed oil, cider vinegar, dill, chervil, chives, and pumpkin seeds. The pumpkin seeds and oil are a traditional touch. I enjoy this salad and have ordered it several times, though on one visit the radishes were watery and overdressed. The Grüner salad arrives in a large glass bowl brimming with a variety of ingredients to play with both flavors and textures: lettuces, carrots, fennel, little pinwheels of chiogga beets, celery, scallions, cucumbers, sunchokes, chickweed, sunflower seeds, and pretzel croutons. Perfectly dressed, (though one time slightly under-dressed), there is lots going on, but all the flavors balance, a slight nuttiness from the dressing and sunflower seeds playing counterpoint. Maybe I was just overwhelmed by the size, but I preferred the Frisee salad of gruyère, artisan ham, walnuts, chives, and creamy mustard vinaigrette. It has lots of interesting textures and flavors. The mustard dressing is balanced, slowly building, but never overwhelming. Schnitzel is a traditional Austrian dish. It’s usually made with veal, but Grüner uses pork tenderloin (technically with pork it should be called schnitzel wiener art). It is my least favorite of all the entrées I tried. However, Schnitzel is one of those dishes that is simple but argued. How thin should the meat be? Should it be fried dark brown or merely to a light gold? Should the bread crumbs be super fine or coarse? Everyone has a different ideal. Here the tenderloin is pounded thin, tender and crispy, and fried with breadcrumbs almost as fine as dust. For my taste it was too dry. I wondered if the breading on the Grüner version might be too fine, with the larger surface area soaking up more of the juice, but have little experience to back my theory. The German butterball potato salad served on the side was simple, just small chunks dressed with vinegar and dill. Accompanying cranberry relish was chunky, bright and balanced between sweet and sour as it should be, though a bit more would help cover the dryness of the meat. A bit of lemon squeezed over the top adds further contrast to the entrée. Translucent strips of cucumber act as a palate cleansing salad. Though the pork was a little more moist the second time I ordered it, it still wasn’t anything special; they could do better. The house-made bratwurst and saucisson sausages are served with sauerkraut, Yukon gold potatoes and sweet mustard. The bratwurst is pork in a Bavarian preparation: lemon zest, salt, pepper and nutmeg. The dish is large, but if you are particularly hungry, you can ‘upgrade to the choucroute garnie, which adds braised pork belly and cured pork tenderloin. The pork belly is quite nice. Too much fat for some, but lovely and sweet with slight apple flavor; it melted in my mouth. The same goes for the pork tenderloin; juicy and tender, slightly smoky with an unusual buttery smooth texture. The night I tried it the sauerkraut was a bit tough and a bit overwhelming to the nose, but the freshness and flavor stood up to the brat. A ramekin of sweet mustard is quite good, a perfect foil to the sausage. This is my favorite dish at Grüner. The other entrées are smaller in size than the full choucroute. Nettle ricotta dumplings with wild black trumpet mushrooms and Parmesan, are lighter than they look. The trumpets are rich and buttery with an earthiness that is balanced with the nettle. This is one of my favorite dishes on the menu, but of course it is only available when nettles are in season. The composition of the mixed grill has changed since I tried it last. It now consists of loin pork chop and Weisswurst sausage, spiced red cabbage, quark spätzle and wild plum preserves. If the rabbit mortadella component comes back around be sure to give it a try. I like the spätzle with morels, braised chicken, Riesling, thyme, crème fraîche and crisp fried shallots. It is almost a risotto in texture, a nice silky quality playing against the chicken and other ingredients which are in very small bits. It looks like a small portion, but is a bit heavy, so you’ll leave satisfied. Grüner has settled in and matured over the last few years. The biggest issues I have seen since my first review, are a decline in the quality of service, and the large jump in prices. Some of the dishes have increased by $5, portion sizes seem smaller, and some of the more expensive ingredients have been substituted with cheaper items. Restaurants are under a lot of pressure to reduce costs, but these changes have moved them into more of a special occasion restaurant. Price: expensive. Entrees $18-$30, appetizers/salads $8-13, desserts $8. Category: Portland Restaurants Now Closed. Related posts about Gruner Restaurant. More about Chris Israel. The Grüner salad is simply the best salad I’ve ever had in a restaurant. The textures and the flavors are perfect. You’re right, it is an enormous salad. Just right for sharing with a friend. Then you have more room to try other items from the menu. The food at Grüner is mostly excellent and never uninteresting. I am really enjoying Gruner’s spring menu after finding the winter one a bit heavy. I agree that some of the marvelous breads need a bit more salt. The pickled beet eggs, hardboiled eggs that are a deep beet red on the outside, are a lovely version of devilled eggs with some horseradish shaved on top – a great starter. Also we used to be able to get a choice of foie gras or the liverwurst but now one can opt for a delicious and light salmon mousse on those mini toasts. I think the frisee salad is now made with slivers of endive (instead of frisee) and it is crave worthy – the endive is light and not bitter. The salads are marvelous and I can’t wait to see what Chris produces with summer’s bounty. I also agree that the quail and boudin is a superb dish, with a mustard sauce and nicely balanced with some braised spring onions or leeks. Gruner is fast becoming a favorite. Thanks for posting this. 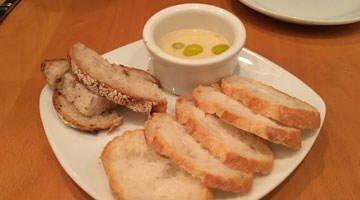 I’m moving to Southeast Germany next month and was hoping to find a place that would give me a little primer on their cuisine. It sounds like a great spot and your review gave me a good sense of the place. Thanks! I like this review. I liked getting the ‘regional’ tour of where these dishes originate from. I’m feel like the ‘lazy’ American. I love to eat but don’t always think about where something originates from. Have you ever thought about food tours through the city? We certainly have enough diversity to make it interesting! 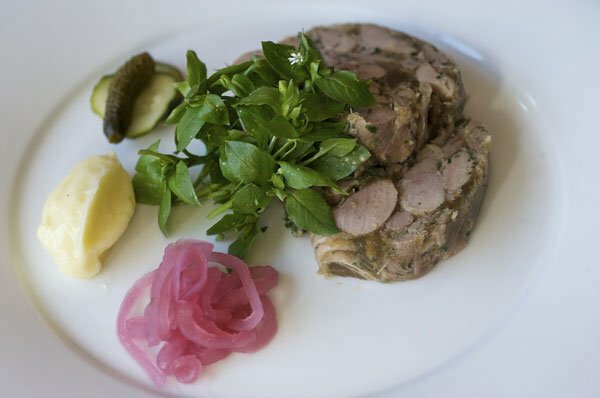 I have had several meals at Gruner and overall have been happy with the dining. The food is interesting and the ingredients are quality, fresh and local. I agree their desserts are their weakest link. Based on this beautiful review, we are going this week. I want the salad! That’s a damn good burger, and very rich (for my tastes). They should serve it with another napkin. The bun is fantastic. Love the ketchup and pickles. never had a “bad” dish or drink at Gruner. The burger has assumed the crown of best-in-PDX after the demise of the Carlyle burger. I feel inadequate writing this without the copious overuse of umlauts. I too appreciate the breadth and depth of our food scene. For local food tours, check out http://www.portlandfoodadventures.com. Chris is a knowledgeable eater and tons of fun. Like I always say, an umlaut is only an option+u away! Hürray! Also, I have been known to eat the Grüner bürger thrice in one week. I mean, I do live close by, but it really is THAT good. Sometimes I wonder, when reading these comments, whether I’ve dined at the same restaurant, sampled the same food, or experienced the same service. I wanted to love Gruner, but I was underwhelmed. We ventured in on a rainy Friday night (seems like they’ve all been rainy of late) and were greeted by the noisy din of avid diners. A short wait at the bar yielded mixed reviews of the house cocktails; one in our party left her drink on the bar virtually untouched after an initial sip. I chided her for not speaking up and returning it to the “beaker and flask” aspirant behind the bar, but she didn’t. Nobody brought her drink to the table after we were seated and nobody questiond whether or not she was dissatisfied. We ordered a bevy of appetizers, all of which were tasty, with exception of the “obatzer.” Maybe I don’t know how the dish is supposed to taste, but the spread reminded me of some whipped butter that had spent time next to some opened camembert on a refrigerator shelf; it had absorbed some of the cheese essence, but was still akin to chewing a mouthful of weak compound butter. A request for more of the delightful pretzel concotions yielded a paltry offering of cold pieces that looked as if they had been served to us from what was bussed back to the kitchen from another table. My spaetzle and chicken entree was well executed and satisfying; although all plates were auctioned off at the table, though we were only three. I felt a lack of organization amongst the floor staff, and a lack of general hospitality throughout the place. 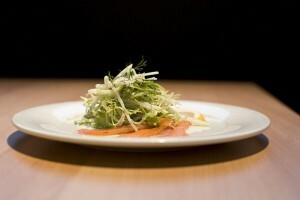 There are too many outstanding restaurants to choose from in Portland; Gruner, to me, is not one of them. My first experience was similar to bitfischer but It was back in January I’ve since been and its much improved! I have to agree with bitfischer there to many outstanding restaurants to choose from in Portland. Gruner is decent and worth a try but there is something about it that just didn’t really make me say WOW. FYI, Gruner will be opening for lunch July 1. And yes, the burger will be on the menu. FYI – Gruner currently serves lunch, according to their website, and a few reviews here that were commenting on lunch. I think I’ll try it that way first! I think it’s officially open for lunch July 5th. Gruner is not a dining experience I will repeat. The atmosphere was so noisy my dinner companions could not hear one another. The pate was unremarkable and quite tasteless. 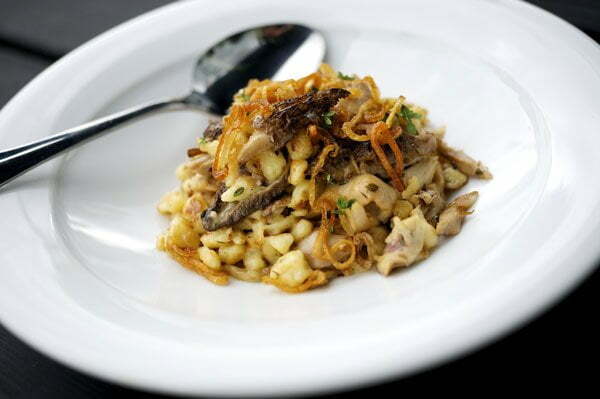 The spatzle braised rabbit was almost inedible because of an overwhelming amount of salt. The delicate rabbit was lost in heavy sauce. The Gruner salad was nicely dressed but contained only lettuce carrots and cherry tomatoes. Overall, a less than mediocre meal for an outrageous price. I recently had lunch at Gruner, based on written hype vs. first-hand recommendation. Granted, some will argue that lunch isn’t necessarily the best litmus for a restaurant – but what can you do, it is what it is. $4 house soda is a tad steep – but the available flavors were fun – spicy ginger, pomegranate, elderflower. A Tale Of Two Waiters… A bit of a bummer for us tonight. Went there after reading the review. Just got back and was so annoyed with our waiter, I am writing a comment. Everything started out great. The waiter seemed really cool and was giving great service. Got the kubota squash dumplings — solid but not hot. Got the Liptauer — housemade cheese — really cute dish and tasty. Around when we finished with starters, I was done with my cocktail. The waiter saw that my glass was empty and asked if I wanted something else. I asked for the menu which he promptly brought. Asked him his opinion on two different beers and went with his recommendation for the Stiegl. Salad came from a runner: green beans and duck breast. This was great. It was easiest the best dish we had this evening. Loved it. No beer. Dinner entree came from a runner. Spaetzl with black forest ham. This was tasty too but not nearly hot enough. The plate was hotter than the food. No beer. Finally, the waiter came to check on us. At this point the Spaetzl was down to about 3 forkfuls. The way he looked at me said, “I forgot your beer.” When he didn’t say the words… I asked him if he forgot my beer. He got angry. Really. Snapped, “it’s on its way.” He did it in a way that kind of makes you slightly afraid of what he might do next. Then he left. He dropped off the beer — no sorry, no nothing. Then left. I felt like saying, I am sure it will compliment my dessert. OK… I’ve never done this before. The beer sucked. I mean skunked sucked. We waited. Our plates were bussed. We waited. Our waiter served every other table in our section. Finally, we flagged down another waiter explained that the beer seemed off. He asked if I wanted something different. At this point. No. Our waiter said nothing to us. It was clear that he was ignoring us. He brought our dessert menus — which consisted of leaving them on the table. It took another 7 minutes for him to come back. We asked for the bill. They took the beer off the bill. Which was cool, but the waiter’s flip in attitude and general lack of service over the second half of the meal kind of put a damper to an otherwise fun night. It was like when I asked whether the beer had been forgotten, he suddenly went Mr. Hyde on us. The whole situation was very strange. So strange, I would not go back to Gruner. While the food was tasty, it wasn’t tasty enough or hot enough to save the incredibly bad service we received. You raise good points about how an off night with service can really color perception and feelings toward a place. I find most places the food not great enough that if the other elements aren’t there, why go back? A question, would have a different approach with the server been more helpful? As in “everything is great but I seem to be missing my beverage” or something along those lines… perhaps that may have not put him on the defensive. But I feel that no matter, the server should never get defensive, solve the problem. Fix it. It’s not hard, we all make mistakes sometimes, just right the ship. There were easily a few ways to correct it (an apology, an offer of dessert, an after dinner drink etc) but in this instance he let the ship (your table, your Gruner experience) go down in flames. Toast, you won’t be going back now, a lost source of revenue for Gruner, a lost bit of positive word of mouth. Inexcusable. I used to be a server and I really didn’t care if the guest was rude or whatever, usually I could correct course if a problem occurred, and the night would be better for it. For all involved. To your point, I thought I was quite nice about asking about the beverage — I think I said something to the effect of “I think maybe my beer got missed.” It was two courses later that he came back to our table without it — so I don’t know what other reason it could be. You know it is funny. We went to Laurelhurst Market the next night and the server forgot our San Pellegrino. We mentioned it. She said, “you’re right I forgot and I’ll be right back with it.” No problems whatsoever. I don’t think anyone is expecting that a server is perfect 100% of the time. I think not owning up to an obvious and honest mistake is a big deal. P.S. We breathed a small sigh of relief that we didn’t have Gruner part 2 at Laurelhurst Market. Service was great and food so tasty I can’t wait to go back. As I am of Swiss descent I thought Gruner would be great. May I say I will NEVER go back after experiencing some of the most atrocious service and longest wait I can remember when there weren’t many people in there, and the entree I got turned out to be a mealy, mushy dumpling. The ambience is also unpleasant. No, thank you, I will go to a fast food place like Burgerville any day of the week before returning to Gruner. We felt this food was very salty and overpriced!